RPGCodex recently interviewed GURPS line editor Sean "Dr. Kromm" Punch. The detailed interview addresses a number of GURPS-related topics including Sean's current projects, the publications he's most proud of, and more. 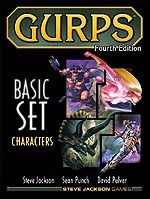 If you're a fan of GURPS Fourth Edition -- or any edition! -- hop on over and give RPG Codex Interview: Sean Punch, GURPS Line Editor, on P&P, Fallout, Digital Media, and RPG Design a read. To connect with Sean or to post your thoughts on the interview, drop on by our forums and say "Hello!"